God is a God of love, but there are things that are an abomination to Him! We seldom think of the future consequences of our sin. However, there is usually "fruit" from our sin, and quite often it is "rotten". Examine some of what the Bible has to say about speaking against a preacher. A young life should be started as young Samuel started his. Examine what the Bible says about angels. Examine what the Bible says about anger. Aren't You Glad You Don't Get What You Deserve?" If we all got what we deserved, we would be most miserable. Thankfully, we do not because of God's grace and mercy! A short lesson on what the Bible says about water baptism. A look at life before Christ changes it. A Christian is often watched to see if his lifestyle is really different and successful. Christian, what kind of testimony do you have? This lessons gives some biblical verses that indicate that the rapture will occur before the Tribulation starts. Satan is still a roaring, devouring lion. Beware of the Drowning Man! This Sunday school lesson/sermon is about the dangers of listening to what others say. A marriage will work if the husband and wife work together and follow God’s plan for them in their relationship. Examine some of what the Bible says about borrowing and lending. These dating suggestions can guide a Christian to finding the right Christian mate! Many that appear to be His, may not be! Examine what the Bible says about the Holy Spirit. What our tongues utter can lead us to sin. 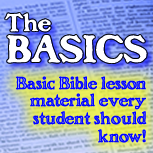 This lesson summarizes the biblical creation story. Ignorantly, many worship "devils" rather than the Lord, all in the name of a religion that does not teach or follow God's commandments. This lessons teaches the biblical principal about living for God, and not letting the old, sinful nature run one's life. Every Christian should be involved in serving the Lord. This lesson lists many ministries that many serve the Lord in. Don't Mess with Me! I Have Bodyguards! Christian, don't be afraid! You have unseen protection. You have your own personal bodyguards. A Sunday school lesson on why we cannot quit! Examine some of the biblical "Fear Nots". There are some things God is finished with. No matter what happens in one's life, God's help is the solution. There is a slavery that is still going on today that affects more than anyone can imagine. Christians and the lost can be bond by this slavery and not even know it! A brief Bible study on true friendship. Problems are very important in one's life. The hardships can be used to put a person where God wants him to be and help make him what God wants him to be. Too often people do not understand Bible verses because they read it out of context. Read and understand preceeding and following verses. Learn what the Bible says about getting things right between those that have offended us. Learn what the Bible says about God's gift of grace. 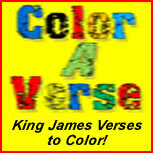 This lesson teaches how and why the Word of God is preserved in the King James 1611 Bible. A brief explanation of the modern bible translations and versions is also discussed. Examine the spiritual gifts for New Testament believers of this church age . Every saved child of God can, and should, have a ministry. Good can come from the hard times we go through. Many people in the Bible were grateful for God's workings and blessings in their lives, as should we. This lesson includes many of the biblical proofs that Jesus rose from the dead. This brief lesson outlines many of the things God has given us! It can be used as a Christmas lesson. Many times, in a Christian's life, the difficulties and hardtimes may be God working in one's life. Examine whom the Bible says Christians should honor and respect. Examine some biblical guidelines to know if you are really saved. Examine many of the high costs one pays for their sin. Get the victory over selfishness, and be happier. Examine what I John 3 tells us about knowing if we are saved or not. Here are some biblical principles to help in identying a good, biblical church. The Bible identifies the unsaved. This study gives several suggestions on how to study the Bible. "I Can't Understand the Bible!" Examine what ususally is behind why one has difficulty understanding the scriptures. Many acknowledge they are sinners, but what they do with that knowledge is often wrong. Where would we be today, if Eve said no to sin? Situations may not change if God is not called upon. The Bible states several proofs in one's life that prove the person really loves the Lord. This lesson shows some of them. If you were to die today, tomorrow, or 100 years from now, are you sure you will go to Heaven? This article shows the biblical way of going to Heaven. Christians are to rear their children to love, honor, and obey the Lord. Unfortunately, we often lose our children to the world, even after doing all the Lord has shown us to do. If one could lose their salvation, it would imply several things. There are many benefits in being saved. Many time our judgments and discernments are incorrect.. Many call God Lord, but is He really their Lord? Excuses that keep many from heaven. Everyone often blames someone else rather than themselves for their actions. The Bible tells us that we will all give an account for our actions before God, and most of our excuses will not hold before His judgment. This lesson/sermon reminds us of some of what we should be remembered when we are facing problems. Often people are not honest with themselves. Read of lies some tell themselves as found in I John 1 and 2. Keep from Backsliding - again! Read how we, as did Nehemiah's people, learn to not backslide again. The most important teaching of the Bible is to obey God. A lesson on discerning God's will and way for one's life. God can do anything He wants with whatever He chooses. Examine some of what the Bible says about marriage. The Bible may be an old book, but it tells of many new things God desires us to have. This lesson points out that there are no little sins. No matter what others do, we must do right! Man has not changed much since the first man. There have always been opposition for those trying to live the Christian lifestyle. Times are not much different than they were in New Testament days. Here is a short biblical study helping us in discerning God's will by knowing what is not of God. Despite what many believe, there are certain events that did not occur at Jesus' birth. Should you obey you, obey God, obey authority, or others? Read what the Bible says about obeying authority. God, many times, allows obstacles in our lives for a reason. Teach this lesson on why the ten commandments, and other biblical commandments, are misunderstood by many. There is only one God, and only one way: His! There are many things that God can do to open one's seeing and recognizing eyes to see what He has done, and what He is doing. This Bible study states what the Bible says about patience. Peer Pressure — the other guy "made" me do it! Even biblical characters had to deal with peer pressure. Any step of faith is blind, but after countless proofs, God's guidance is as real as the column of cloud by day and column of fire by night The Israelistes followed. We ask of God much, but we need to thank him and praise Him for the mighty things He has done! This lesson teaches much of what the Bible reveals about prayer. This study covers some of the prophecies about Jesus' birth. God is a God of love, but there is another side of Him. Examine some of what the Bible says about rearing children. Many claim to have faith, but few have the kind described in the Bible. This lesson describes what the Bible says is real love. Just being religous does not guarantee anyone heaven. Repentance is the "… pain, regret, or affliction which a person feels on account of his past conduct". Repentance is important for salvation. It sends a false message to children when we give an imaginary man the same attributes as Jesus Christ! Learn more of our adversary, Satan. Learn what God's Word has to say about parenting. Selfishness can ruin one's life and cost a person many blessings. All people look for God sometime in their life. Unfortunately, many look in the wrong places and do not find him. This lesson discusses why and where He is looked for. Too many Christians have traded their birthrights for cheap trinkets. Read what the Bible says about drinking alcohol, and you will quickly see that we should abstain from it, if we want to obey what the Bible says! This lesson defines many of the sins that were a result of people getting further from God in Romans 1. Learn a litle abot our Christian heritage and of the Christian's history. This brief lesson highlights some of what God's Word says about soul winning. Participation in certain activities can ruin ones Christian walk. Since the first man and woman were on this Earth, there has been a battle to change and hide God's Word from mankind. It still continues today! It is not easy and popular to tell the world what the Bible says, but it is a Christian's responsibility. God will bless the truth and not the sin of lying — no matter how "small" one colors the sin. Be honest! God wants Christians to obey Him. There can be alot of problems if we do not! There is only one way to heaven accordingly to God's Word. As we learn from Joseph in the Bible, there may be a time to forget some things that have happened in our life and go forward! Many have their own beliefs of what they think will get them to heaven; but if their beliefs are not what the Bible teaches, they will never get any higher than the coffin lid. When one gets saved, many things happen that, at the time, he may not be aware of. Here are some of those things that occur. According to the Bible, there are things on this earth that are not that important. As a Chrisitan, we should be a good example to others. I Peter 2 reminds us of what a Christian is in God's eyes. We Have A Lot of Nerve! We have a lot of nerve in judging others when we also are sinners. What's a Child to Do? What are some of the responsibilities of a child? Examine what a person can miss when they become an obedient Christian. Here are some reasons many do not go to church any more. This lesson highlights some of the many blessings a Christians receives, as shownt in Proverbs 10 and 11. This short study highlights what God knows about us. God not only knows our heart's intents, but He sees all we do. This brief Bible study gives an idea what God sees in us. The Bible is not just a book, it is God's preserved Word. What Is Wrong with Sin? This lesson examines why sin is bad for us. Examine this short study on unbiblical ways to get to heaven. After we are saved there are many things God expects us to do. Prayer is the solution to most problems. Examine what the Bible says a Christian should do when he is opposed. This lesson sites several of the times God had to curse countries/ people. There is also a brief listing of many of reasons God would curse a people. All will get sick one time or the other. Health problems do not always mean that God is punishing someone. Examine some of the damage done when a Christian misses church. This lesson gives many biblical instances where a child of God was negatively affected by choosing the wrong associates and listening to their counsel. Wrong advice can hurt one's life; good counsel can guide it. Do you find that you are not excited and interested in the things of God like you used to be? There are many counterfeit Bibles, but the King James Version is the only preserved Word of God. Which Part of the Wall Is Yours? In Nehemiah's day, many joined together to restore worship. Today the same need exists, and Christians should join together to tell others about the Lord! Read a brief summarization of about Jesus and who He is. Whoa! Woe Could be Headed Your Way! Problems could be headed your way if you are involved in sin. This study tells who the Bible identifies as being a fool and what God describes is foolishness. A brief spiritual examination into why Christianity is receiving opposition. Here are a few of the reasons why people do no win lost souls to Christ. This lesson teaches what is missed when one misses preaching. Several reasons why a child of God should attend the house of God. Read five reasons why the "begats" in the Bible are important. There are many reasons why sickeness comes into our lives as it happened to these Biblical characters. Many pastors today are obedient to what God led them to do, but there are some, as were some priests in Ezekiel's day, that shirked their responsibilities. This lesson states what the Bible teaches about work and working. Your most valuable possession is the value of your name. We are responsible, before God, for the words that come out of our mouth. 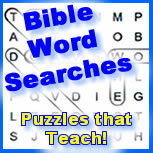 This page contains biblical subject studies that can be used as sermon ideas or Sunday school lessons. Most of these have been used as children's Sunday school lessons previously, so they can be scaled up or down to fit most classes. 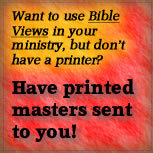 The format is brief and intended to be used as ideas for teaching or preaching. These Sunday school resources should be added to by the teacher's own studying. These lessons were also featured in the weekly, ministry version of The Bible View.